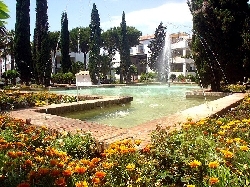 Apartment in Marbella area, Costa del Sol, Spain: This garden apartment is in a beautiful tranquil setting, overlooking the main fountain and waterways of the established El Presidente complex. The inspiration for the grounds came from the design of the magnificent Alhambra Palace in Granada. 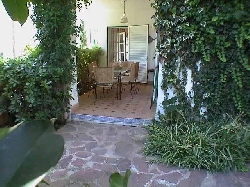 We chose this apartment as our second home because of it's location in the original, quiet, established part of El Presidente, overlooking the mature sub tropical gardens. Redecorated throughout and totally modernised, the accommodation is fitted to a very high standard, with all of the comforts and luxuries that you expect at home. 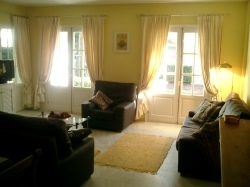 We benefit from large marble floored open plan living areas with Air Conditioning/heating, Wi-Fi, a fantastic internet based TV system with countless TV channels from several countries, including Sky sports, Disney, and hundreds of movies stored plus box sets, you tube etc. ,DVD. Fully fitted kitchen including dishwasher, washing machine, built in oven and ceramic hob and microwave and coffee making machine, all set against fabulous black granite work surfaces. The master bedroom boasts a king sized leather sleigh bed, with french doors leading out onto the terrace and private garden. The second bedroom has twin beds, though can easily be pushed together to make another large double if required. Both bedrooms have en-suite bathrooms, again totally newly refitted, consisting of a bath(in the main en-suite), shower, sanitary ware in white porcelain with chrome fittings and complementary tiling and decor. We have a very spacious lounge and dining area (with seating/dining for 6), with two three-seater sofa's (which are also sofa beds), hence allowing the apartment to comfortably sleep 6. Another doorway from the lounge also leads out onto the terrace where there is a table and chairs for outside dining and a BBQ. 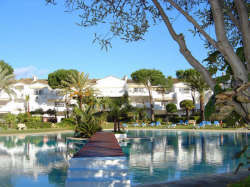 Being at the heart of the complex, you are 2 minutes walk to all 5 pools, one heated year round. 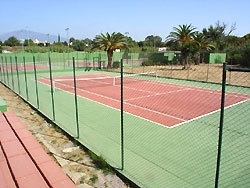 Just a 3 minute walk to the 4 free tennis courts, and a 5 minute stroll to the beach and chiringuito. 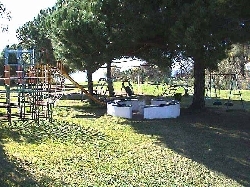 There are many interesting family activities nearby as well as 30+ golf courses easily accessible. 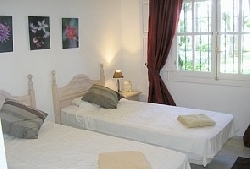 The apartment is ideal for either winter sunshine breaks or summer holidays. 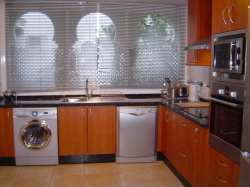 For parties of more than 4 people, we charge an extra �25 per person per week to cover extra laundry/cleaning costs. Please note that we only accept Saturday to Saturday rentals in the summer months. Bookings of less than 1 week will incur an 80 Euro laundry and cleaning charge.